On my first visit to China in the early 1990s I found at every hotel that I stayed in, in all major cities, the only non-Chinese cuisine available was Italian. Vegetarians had to either look for a ‘Buddhist’ restaurant or an Italian one where pasta and pizza with just tomato sauce and cheese was always available. The China-Italy relationship is an ancient one and so is that between spaghetti and noodles. For a long time it was assumed that Marco Polo had either taken spaghetti to China or brought back noodles to Italy, and so the two were linked. But, more recent studies suggest that the two slippery carbohydrates may have independent origins, and while one is eaten using chopsticks the other is eaten with a fork. Forget history. Today, an increasing number of Chinese eat spaghetti and visit Rome, and an economically-distressed Italy is hungry for Chinese tourists. Surprisingly, not enough number of Chinese are making the journey, despite the increasing number of flights. Last year, Rome welcomed 27 million tourists and only one out of every 20 was a Chinese. That number could easily double and triple. Italy has harked back to history to rediscover the ‘old’ silk route, and justify its latching on to the new silk route, aka the Belt and Road Initiative (BRI). Strategists and politicians from Berlin to Washington, DC and from Paris to London are not too excited finding spaghetti in their noodle soup. 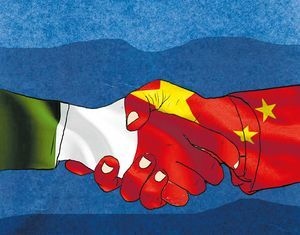 Italy’s decision to be the first member nation of the European Union and of the transatlantic alliance to partner with China’s most important geopolitical initiative, BRI, has been in the works for some time, given its economic woes. Apart from access to China’s markets and funds, Italy wants more tourists. Tourism is a major source of income for Italy and Chinese tourists are becoming increasingly important for tourism-dependent economies. In 2018, Chinese travellers made 140 million outbound trips, spending $120 billion abroad. Given the lure of tourist spending, China has used outbound tourism as a geo-economic tool. In small, tourism-dependent, island economies in the Caribbean, South Pacific and around the world—including Sri Lanka and the Maldives in India’s neighborhood—Chinese tourists in search of sunny beaches and the exotic have become an important source of foreign exchange. A highly regarded Chinese economist has even gone to the extent of suggesting to such countries that they forget about manufacturing and focus on attracting more Chinese tourists. Money earned from tourism would pay for imported manufactures. What China wants from Italy, in exchange for its tourists and funds, is access to key ports like Trieste that would then give road and rail access into eastern Europe. It is understandable that Germany and France are upset with Italy striking out on its own and not playing by the European Union’s rules. But, the Italians have been unhappy with EU for some time now. Italy’s tourism industry strongly feels that dumping the Lira and adopting the Euro has cost Italy dearly, raising the cost of Italian tourism. With new tourist destinations in Europe opening up to the price-conscious Asian traveller, Italy is under pressure to remain competitive. The Italian decision also brings into sharp relief the downside of US President Donald Trump’s “America first” policy as far as relations with western Europe are concerned. Sometimes exerting pressure and sometimes just not bothering, Trump’s whimsical policy towards longtime allies in the name of defending US interests has opened up new spaces for Chinese and Russian diplomacy in the West.